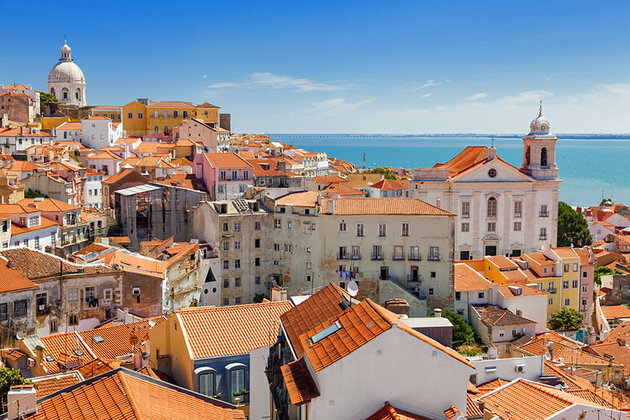 Alfama is the oldest district of Lisbon and is a delightful maze of narrow streets, which lead from the Tejo river uphill to the castle. 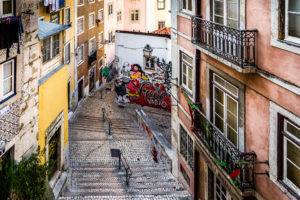 Contained within this ancient district there are some of Lisbon’s most historically important buildings including the Se Cathedral, Lisbon Castle, National Pantheon and Saint Anthony’s Church. Because the streets are so narrow, we didn’t design a specific route. It’s sorta fun to wind your way along the narrow, hilly streets — and be prepared to do some stairs. A good place to start is Rossio Plaza (metro stop), and run along Rua Augusta, until you reach the intersection of Rua Conceicao, and turn left, following the streetcar line. Run up the hill, passing the cathedral, to the the Miradouro de Santa Luzia, which has great views of the area. You’ll see signs leading to the castle, following Rua de Santa Cruz do Castelo. Rua do Salvador is the steepest street in the Alfama neighborhood. Note: Footing can be challenging and it can be very crowded in summer. The easiest way to not get lost is to follow the #28 Tram line.